I’ve been a little lax about posting lately. You know, life gets in the way sometimes of the fun. It’s not that I haven’t been tasting. I have lots of tasting notes to share. I just haven’t got around to putting them up here. So let me tell you about a couple of wines I had recently. First let’s talk about the miss. 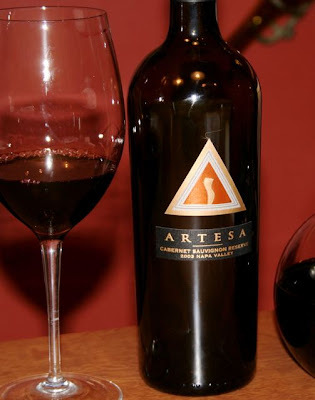 I had high hopes for this Artesa 2003 Napa Cabernet Sauvignon Reserve. A $40 bottle of wine on sale for $30. Not a bad deal, I thought. And it might have been good. It had a gorgeous deep dark color. On the nose aromas of dark red fruits and caramel wafted in. It almost reminded me of rollo candies. It also smelle of dusty wood. On the palate it had initial big red fruits and beautiful cherries, firm tannins, and a nice acidity. The big fruit dissipated quickly leaving a rather thin mid to end palate. However, it did linger for quite a while teasing you. I rate this wine a little bit lower because the alcohol was out of balance. It was noticeably hot. The label says 14.5% but it tasted like it was even higher. For $40, or even $30, I expect a balanced wine. I don’t think I would spend that money again for this wine. Now, for the hit I had to go across the pond to France. The 2005 Domaine Grand Veneur Côte du Rhône Village I found to be extraordinary! Just what I like in a French wine. It had a really nice, dark, ruby red/purple color. The nose was amazing to me. On my first sniff my mind thought – “Hmmm, chokecherries!” It had bright red fruits, chokecherries, red licorice and raspberries on the nose. It was even better when I tasted it. Super balance of the red fruits, raspberries, cherries, licorice, and hints of like roasted green vegetables. It had smooth but firm tannins, a balanced acidity and a lingering long finish. Just delicious! It didn’t taste hot at all, though the alcohol was the same 14.5% as the previous wine. This was one excellent bottle!